What is Groton Regional Theatre? Groton Regional Theatre is organized exclusively for charitable, educational, scientific and literary purposes, to establish a theater group in order to produce full-scale theatrical productions, in an effort to entertain general audiences as well as increase the awareness of the performing arts in Southeastern Connecticut and Southwestern Rhode Island. mounting full-scale productions and providing theater education through creative and technical workshops. 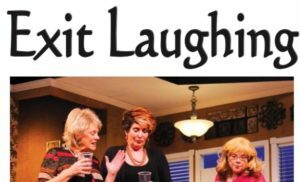 Click here to learn about our upcoming show Exit Laughing! Show dates are March 29-31, April 5-7 and April 12th and 13th. Friday nights are Dinner Theatre at 6:30 pm – tickets are $25. Click here for menus. If you would like to request a vegan meal, please email grotonregionaltheatre@gmail.com. Thank you! Saturday night shows are at 8 pm. Tickets are $15 in advance and for seniors. Sunday matinees are at 2 pm. Tickets are $15 in advance and for seniors. Please NOTE: We are unable to accept credit/debit cards at the Senior Center. Cash and Checks only if you are purchasing at the door. Thank you!